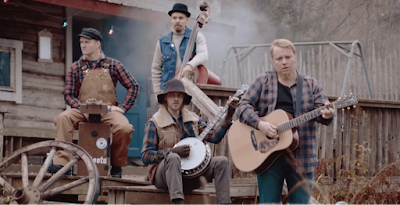 STEVE 'N' SEAGULLS To Bring The Hillbilly Hard Rock Back To The U.S.
Finland's riotous rockers STEVE 'N' SEAGULLS, known for rabble-rousing renditions of sempiternal rock and metal standards, will bring the hillbilly hard rock to the U.S. once again with a winter tour. The band's second album, Brothers in Farms, topped the Billboard Bluegrass Chart. Winter 2017 tour dates are below. Watch the unforgettable S'N'S interpretation of Guns N' Roses' epic power ballad "November Rain" HERE.